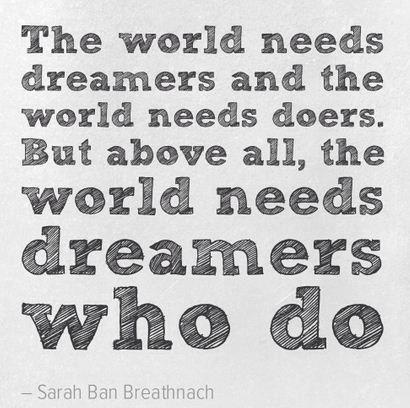 8 February 2016 by Daniel Dercksen·Comments Off on Are You A Dreamer Or A Doer? Dreams are good; action is best. There are dreamers who can’t get things done and waste their talent and resources and doers who can’t dream, that reach too low. The daydreamers sit down and think about what they could do but never follow through. They are writers who constantly talk about how they want to write the next big film or book, or have an idea that will revolutionize the world. As time goes by, they will still be at the same point in life as they were before: the “I have an idea…” stage. Dreamers have their feet in the air and their head in the clouds. The dreamer is a writer who lives or escapes to world of fantasy or illusions and is referred to as a visionary or an idealist as opposed to a doer, or realist, a writer who seeks to represent the familiar or typical in real life rather than an idealised or romantic interpretation. Doers have their feet on the ground and their head in the sand. What makes the doers distinct from others is the ability and the willpower to take advantage of opportunities that arise. They have the ability to execute. Daydreamers are wannabe-entrepreneurs; the ones who have the ideas and want everyone around them to put in the hard work. They think they have the next big thing but fail to realize that someone else out there probably has a similar idea. Ideas in isolation are worthless — the value of an idea comes from its execution. If you have an idea and don’t do anything about it, it holds no value whatsoever. Just like in any other aspect in life, if no time or effort is put forth, return is minimal. Maybe you’ve been called a dreamer your whole life—by others and by yourself. However, saying you are a dreamer or a doer is like saying you are good or bad. Nobody is 100 % one way or the other, but they may lean more in one direction. It’s a spectrum, and the good news is that you can shift the paradigm so you’re a little more balanced. Nothing beats and competes with passionate dreamers who turn their dreams in reality through relentless persistence and determined perseverance. It is rewarding to turn a dream into reality by writing your story, and then turn words into action. Believe everything is up for improvement. Think decisions are soft squishy things. Say yes to new ideas easily. Hate systems and repetition. Nothing has to be done the same way twice. Chase new ideas like the fox chases rabbits. Wonder why doers drag their feet. Dreamers are paralyzed by options. Think decisions are things to be acted on, not rethought. Feel fulfilled when projects are completed. Love systems. Excellence is a well-oiled machine that produces excellent results reliably with minimal input or oversight. Stay focused like a dog on a bone. Make up reasons why it won’t work. They have a low tolerance for learning as you go. Wish dreamers would just finish something. Choose the path to success quickly. Creating options is over-rated. Listen to dreamers for ideas. Listen to doers about execution. If you’re really off kilter and have a lot more dreamer tendencies, it’s time to take action. Write down goals and give them a deadline. So, you say you want to write a novel and have it ready to submit to literary agent or publishing house. That’s awesome – but how far along are you? What do you define as “submission ready”? How long can you write per day, and is it scheduled into your routine just like work or going to the gym? Depending on where you are with your draft, choose a deadline for being submission ready (less than two years out), or schedule mini-deadlines, such as two chapters written by month’s end. This approach works for any goal, not just a novel manuscript. One of the best things you can do for your professional reputation and sense of self is to set and meet deadlines. It’s also the only way you’ll reach your goals. Set goals and track your progress. Map your journey from inspiration to final draft and be realistic about how long it will take to complete each step. If you are working on developing your characters, you might need time to do the research. Be realistic. Give yourself some cushion. It’s important to be realistic about how quickly you can accomplish a task. Do yourself a favour and factor in a little more time than you think you need when you begin setting deadlines. You already know that things could get off track! If you’re unsure about how much time you really need to budget, reach out to someone with experience. It’s tempting to overpromise and try to be Superman, but I guarantee that your colleagues would rather you just not be late. If you don’t end up needing the extra time you factored in, you may even make a deadline early, and that’s sure to impress. Have a Plan B, and even better, a Plan C. Surprises, setbacks and roadblocks are inevitable. You may not know where they’re coming from, but trust me: Things will go wrong — they always do. So think about alternatives and backups before you even get started. If you create options for yourself, you will have less stress. If you’re embarking upon a new project, there’s only so much you can learn on your own. Reach out to a mentor and ask, “What should I be aware of? What could go wrong?” Their advice will save you time and money. Set explicit expectations. Time and time again, I’m reminded that other people have different ideas about what constitutes timeliness. It’s best to establish very clear expectations with the people you work with — ideally in writing. Be a leader. When things go awry, keep your cool. Others will follow your lead. If you have made a mistake, it’s best to own up to it directly. We’re all human. It’s not the end of the world — really. The sooner you let go, the more quickly you’ll be able to move on. Every time you decide you want to do something, follow that up with a list of steps you need to take to make it happen. This might mean saving a certain amount of money. Look at your budget and figure out what you need to cut to make that happen. You might also need to pick up more hours at work, a second job or practice more frugal living. Don’t be shy to negotiate different options in reaching your goal. Assume everything will take longer and cost more. One of the downsides of being a dreamer is that it is easy to think of everything as, well, easy during the dreaming stage. However, things have a tendency to take more money and time than you .Don’t let your drive to be a doer brush your dreaming tendencies totally under the rug. It’s your source of inspiration, creativity. Work harder and work smarter. Very successful people typically work very hard, in addition to working smart. They put in more effort than their staff and peers, and they often get more done. What they work on and how they work sets them apart even more. Have an unwavering focus on creating value for customers and the organization above all else. Work with purpose and passion every day. Take a minute to genuinely assess your commitment to value creation and your energy and effort levels to see if they’re calibrated with the success you’d like. Keep your own score, ignore everybody else’s. Be relentless about your own goal achievement and hitting the milestones you set for yourself. But waste no time or energy on what others are doing (or not) or the credit they may be getting organizationally — tempting though it may be. Focusing all your energy on your own results will keep them high, while focusing on others’ takes time away from your achievement and diminishes you in almost every respect. Things will inevitably go wrong, so practice quickly analyzing why they did and then moving forward fast. Replaying the situation or getting caught up in real or imagined dialogue around it wastes time and often exacerbates the situation. Once you’ve harnessed the learning, just drop the angst, stop the replays and get back to the value mission. This is a big one, and not just because some things are scary, but because a lot of people don’t have the courage to face their fears. They choose to live “in denial,” or what Henry David Thoreau called “lives of quiet desperation.” And yes, it is a choice. Even if you’re not consciously aware, on some level, you know more about what you’re doing and why than you probably realize. This is another big one. You hear a lot about procrastination, these days. There are all sorts of articles about how to do it less, be more productive, take the first step, and all that. It’s all bull. If you procrastinate, it’s for a reason, and that’s usually because you’re either scared or it’s not really your priority. To accomplish great things, that has to be your top priority. If not, you’ll find plenty of excuses not to make it happen. We also hear lots of talk about circumstance keeping people – usually the underprivileged – from becoming successful. Since many, if not most, of the highly accomplished people started with nothing, don’t let this become an obstacle. Previous Previous post: Review: Follow The Granny For A Perfect Day!